In the US of A, the Cardless ATM (Automated Teller Machine) is gaining traction as there is a rash of US bank are installing Cardless ATM’s. These Cardless ATM’s allow their various clients to use their smartphones and Mobile Money apps to transact business with their banks, even set up bank accounts as well as withdraw cash…..all without having to insert their Debit or Credit Cards. Makers of ATMs and financial software groups are installing these smartphone-enable ATMs that use everything from Bluetooth, RFID (Radio Frequency Identification) to NFC (Near Field Communication) to allow smartphones to act in lieu of the traditional plastic card with the magnetic strip that has been around since the 70’s. Some of the new technologies require only a software update to the ATM, while others will need new hardware to facilitate even the use of Iris scanners and fingerprint scanners to authenticate the user’s identity. Then the Bluetooth, RFID, NFC link or even a QR Code capture using the smartphone’s camera is then used to execute the transaction to the card via the App on the smartphone. Already FIS Global, a major provider of software and technology for ATMs, has deployed 2,000 ATMs at some least 28 banks in the United States with plans to deploy some 80,000 machines in North America in the next 18 months. So what exactly is driving this trend towards Cardless ATM? Aside from the more tech savvy customer who doesn’t like having to stand in line in a bank to get their money, there is also the increased need for security. It’s very easy to skim Debit and Credit Cards, which involve criminals, steal the data on a card, often by inserting devices into the ATM card slot. The problem of skimming is estimated to cost the global banking industry some $2 billion in 2015. Worse, the data gleaned from the Credit Card can be used for identity theft. It can also lead to more serious crimes, such as robbery and even hacking into the banks financial Networks, where billion of dollars worth of transactions takes place. 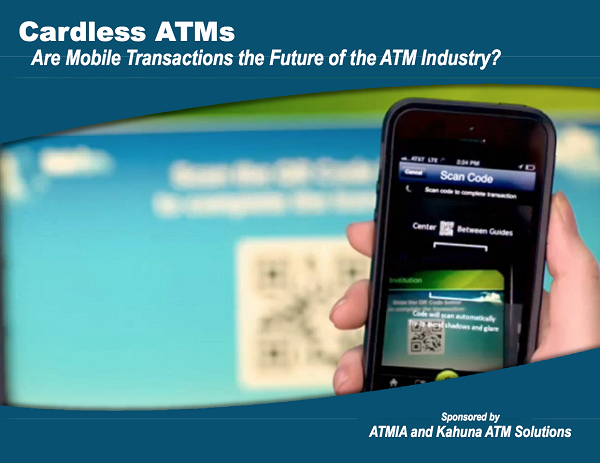 ATM, being the first point of contact for customers, can be made more secure using Iris scanners and fingerprint scanners to authenticate the user’s identity and then Bluetooth, RFID, NFC link or even a QR Code capture using the smartphone’s camera to complete the transaction via the App. The rising trend of cashless transaction options such as Apple Pay, Android Pay and even Samsung Pay which is baked into the Samsung Galaxy S6 Edge Plus as pointed out in How Next is Now for launch of Samsung Galaxy S6 Edge Plus in Jamaica mean more Americans want the convenience of speedier and more secure transactions. To this end, these banks are partnering with Apple Pay, Android Pay and Samsung Pay to make transaction easy, convenient and more secure for this increasingly tech-centric crowd. With this ease and convenience of being able to use these Mobile Money services to withdraw cash, come faster transactions, taking around 10 seconds instead of the usual 30 to 40 seconds. But if you can already do transacting via Apple Pay, Android Pay and Samsung Pay, why do you need to withdraw cash? Banks are in a fight for relevance as Mobile Money and robotics automation is set to make them obsolete. Evidence of this can be seen from the developement of so-called headless ATM that have no screen or keypad. Instead, the interface with your smartphone, using it as the screen and keypad and executing the transaction using your smartphone’s own processing power via a secure Bluetooth or Wi-Fi link. Again, there is the need to authenticate the user using Iris scanners and fingerprint scanners and such ATM have the potential to make ATM not only smaller but eliminate the need to even carry cash, especially if you’ll be spending via the Apple Pay, Android Pay and Samsung Pay App from your smartphone. Something tell me that the Banks are fighting for relevance as truth be told, there is actually no need to withdraw cash. In fact, once Apple Pay, Android Pay and Samsung Pay reach critical mass, all transactions could be done without the need to handle physical cash or even using your Credit Card. You can even opt to use the more secure bitcoins, built upon the security of block chain encryption, rendering the need for Banks and ATM’s pointless. This as you could do peer-to-peer banking, borrowing money in a manner similar to downloading an MP3, Venmo style! All of this is happening in the US of A, but Jamaica is already pushing towards Mobile Money. Meanwhile in Jamaica, CONEC Mobile, a Mobile Money partnership between JCCUL (Jamaica Co-operative Credit Union) and Mozido Jamaica, is already gaining traction since a bump launch back in 2012. Digicel has plans to go Mobile Money, after having purchased both Prism Holdings, on Friday December 4th 2015 and Paymaster on Friday December 11th 2015, both for undisclosed sums of money. Supreme Ventures also has plans to launch Mobile Money, having upgraded to an IFLEX Betting Platform Upgrade in October 2015 that enables them to do Mobile Money transactions via their revamped App. Finally, GraceKennedy has hinted at plans related to rolling out Mobile Money in their Hi-Lo Supermarkets in a bid to tap into the US$2 billion Remittances market. One wonders if an impending Mobile Money this is the reason why NCB had rolled out cross Network banking as well as the ability to create your bank account from home in January 2016. I suspect NCB may be using their Digital Innovation Challenge as per Kelroy’s article NCB sends out Digital Innovation Challenge as a clever way to launch their Mobile Money platform by canvassing the ideas of local Software Developers. One a Software Developer has made a NCB Mobile Money App, they have the hardware people change out their ATM’s to facilitate smartphone based transaction, with fingerprint scanners to authenticate the users identity and then Bluetooth, RFID, NFC link or QR Code capture using the smartphone’s camera to complete the transaction via the App. Then from that point on, the other Mobile Money partners services will start to gain traction, forcing our local Banks to start upgrading their ATM’s in a manner similar to what’s happening with the banks in the US of A. NCB, with their Mobile Money App and Banking Platform, would be way ahead of the competition.